As you may know, we are a multicultural, multilingual family with quite a few different languages being spoken in our surroundings. As the children's father is from Turkey, Turkish is the main language we are teaching the children. It can be very difficult to teach the children a non-native language, and even more difficult to maintain it. Therefore, I am always on the look out for new ideas or thinking up creative ways to make language learning fun. I set up the activity outside on the patio. I placed a tuff tray on the ground with some A3 sheets of white paper on top. 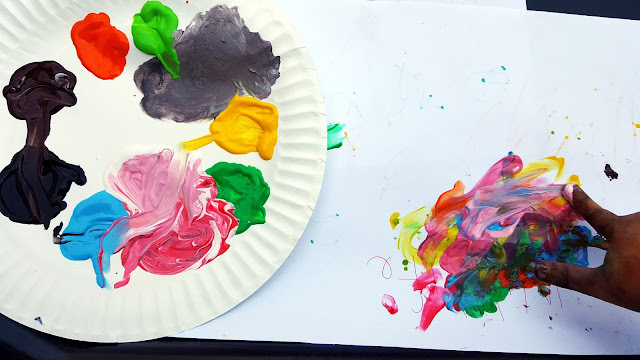 Then I squirted some poster paints on paper plates. I told the children our aim was to make some wild animals using finger painting techniques. 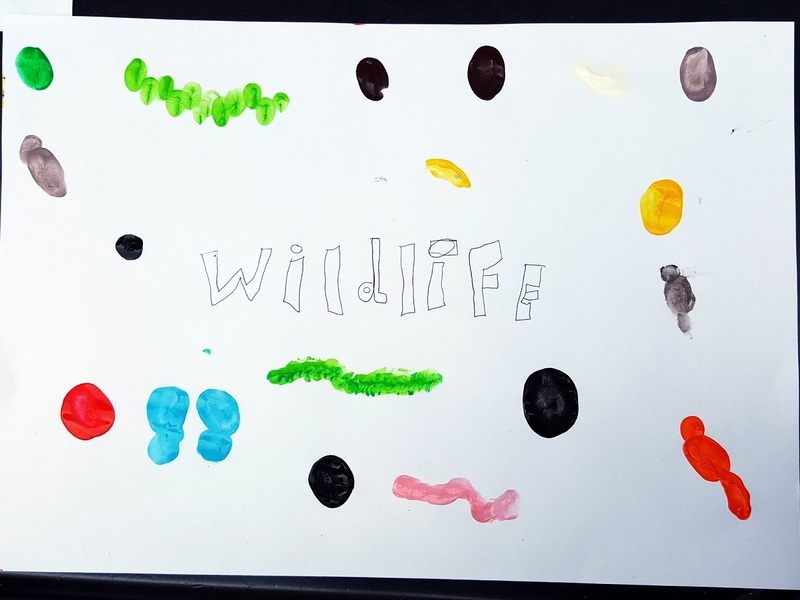 I told them to use the paints to do the shapes of the animals and we could draw the details in once the paint had dried. 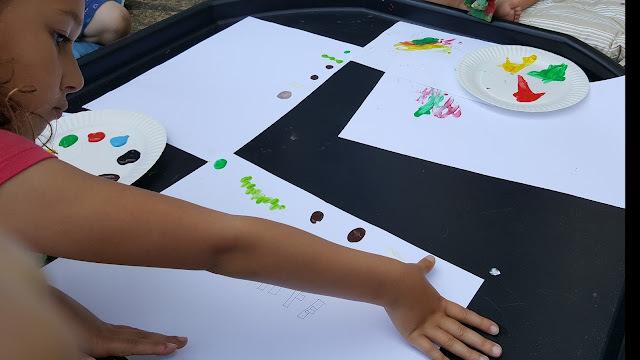 The children were very excited about this activity and soon got stuck in. Here is D's picture after she had finished finger painting. Here is R's attempt. I love to see the different ways they interpret the task. K had a lot of fun swirling the paint around with his fingers. 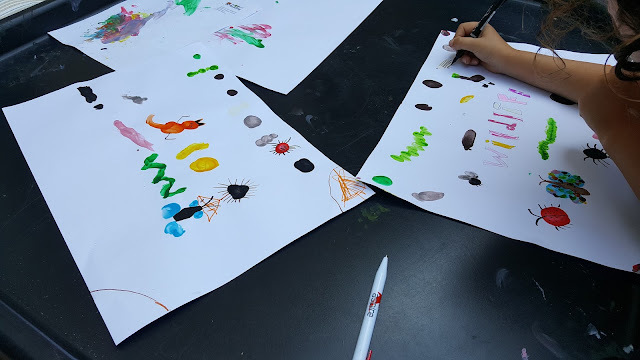 Once the paint had dried, the children began to draw in the animals' features with black pen. While they were doing this we spoke about all the different features each animal has. You can use vocabulary from the language you are learning to do this. 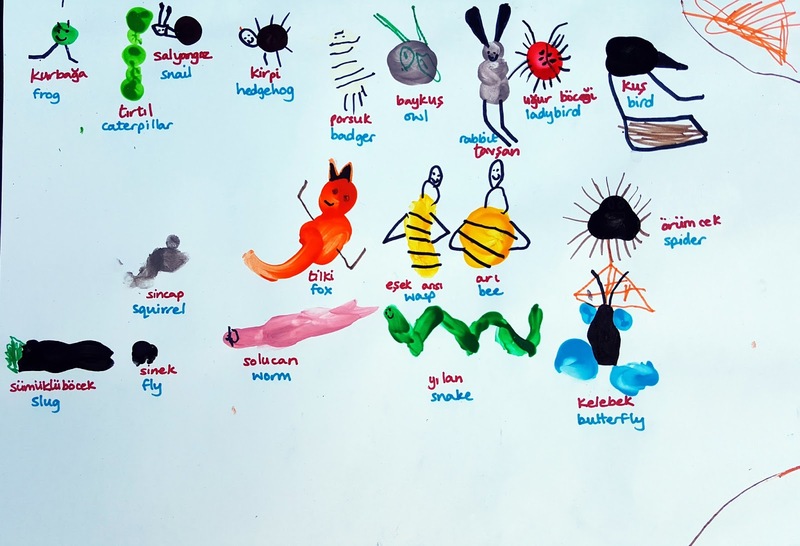 We talked about what colours the animals were in Turkish. We also used Turkish body part vocabulary. 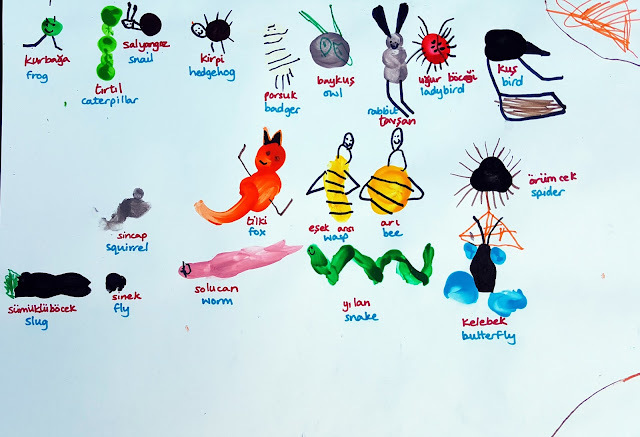 Finally, we wrote down the names of the animals. The Turkish names are in red and the English names are in blue. It is not necessary to write the names in English as well, you could just write them in the language you are learning. 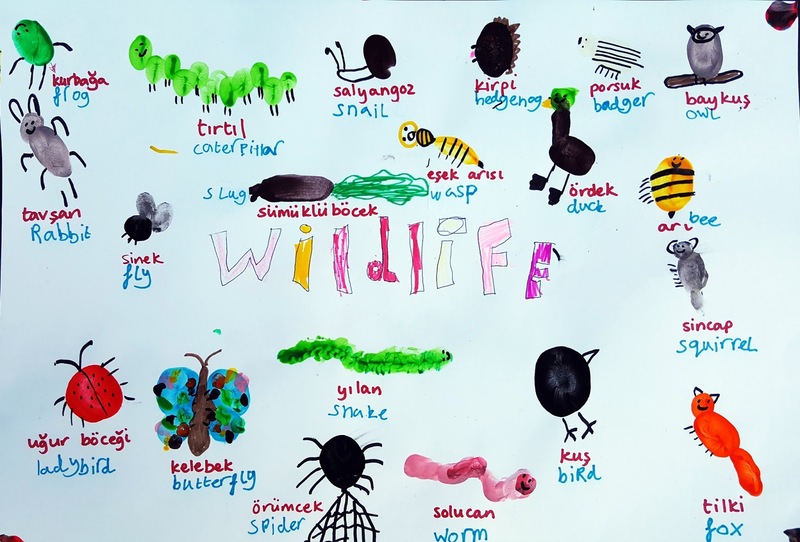 However, as it can be quite difficult to tell from some of the drawings what the animals are, I thought it best to write down the names in both languages. I will now display the posters on the wall for a while so the children can get familiar with the new vocabulary. They make such a bright and colourful display! Masha allah sis. We're not a multi cultural home but I do like the idea of teaching little ones more than one language. Especially when they have this much fun doing it! It's easier for them to learn when they are young. The earlier the better! Unable to comment using my WordPress account. I bet your class would love it! I would love to do this when my daughter is a little older. Can you guide me as to how I can start my daughter on finger painting though? I have been wanting to do this since few weeks but am really looking for simple and sure to work guideline. 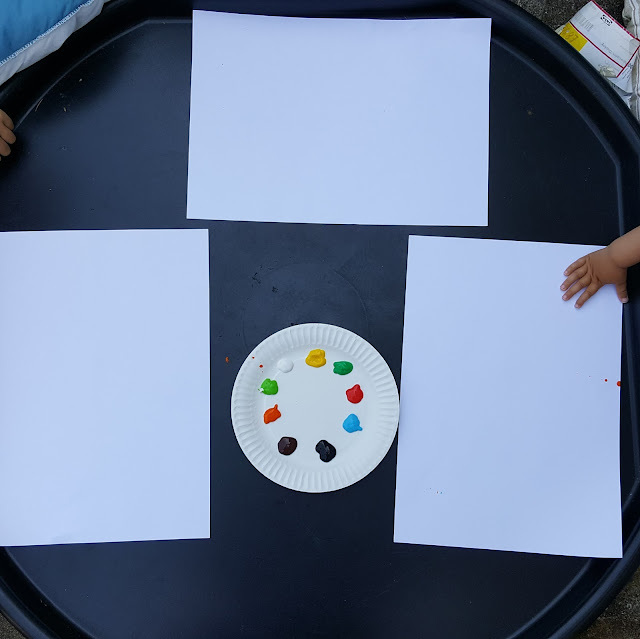 She is 1 year old, I want her first work to be on canvas so that I can save it so using yogurt with colors is kinda doubtful to me if it will stay there for years...so baby safe paint? which one? 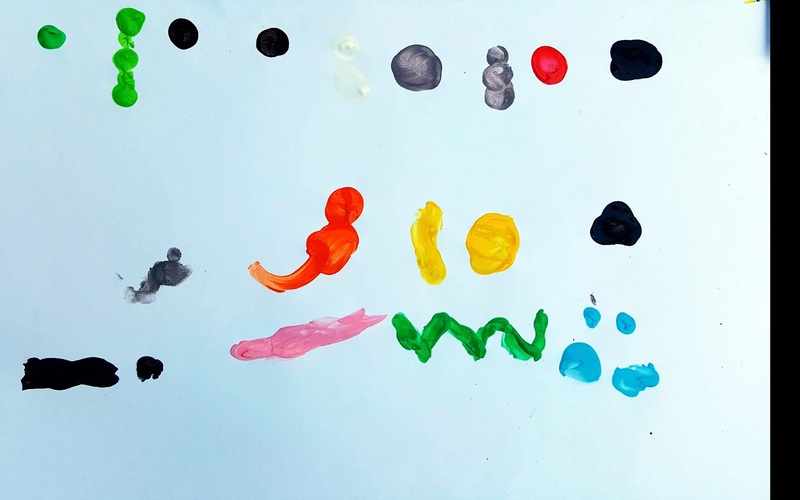 My youngest has just turned 2 and he has used normal poster paints since before he was 1. He doesn't ever try to put them in his mouth. But I guess some children do. There are lots of recipes online for how to make your own paint. I've made paint before using flour, salt and colouring which makes it edible but not tasty. 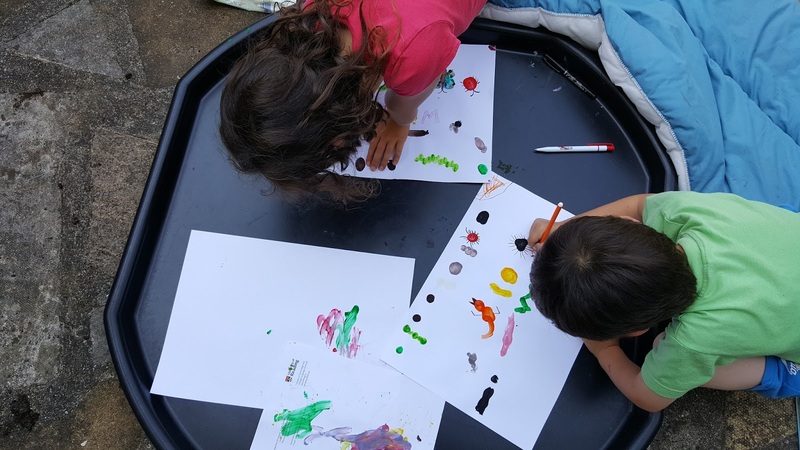 Young children love to paint, especially with their hands so finger painting is perfect for them. You really hit all of the great children's activity concepts with this one! Creativity, dexterity, language, imagination, and of course fun! Looks like a great idea. Oh this is a beautiful way to teach your kids your language. I am in the process of doing so with my eldest but I haven't been as creative as you with it yet. Yes you're right it's a fun activity for doing in one language too. Your teaching style is so inspiring. MashaAllah. 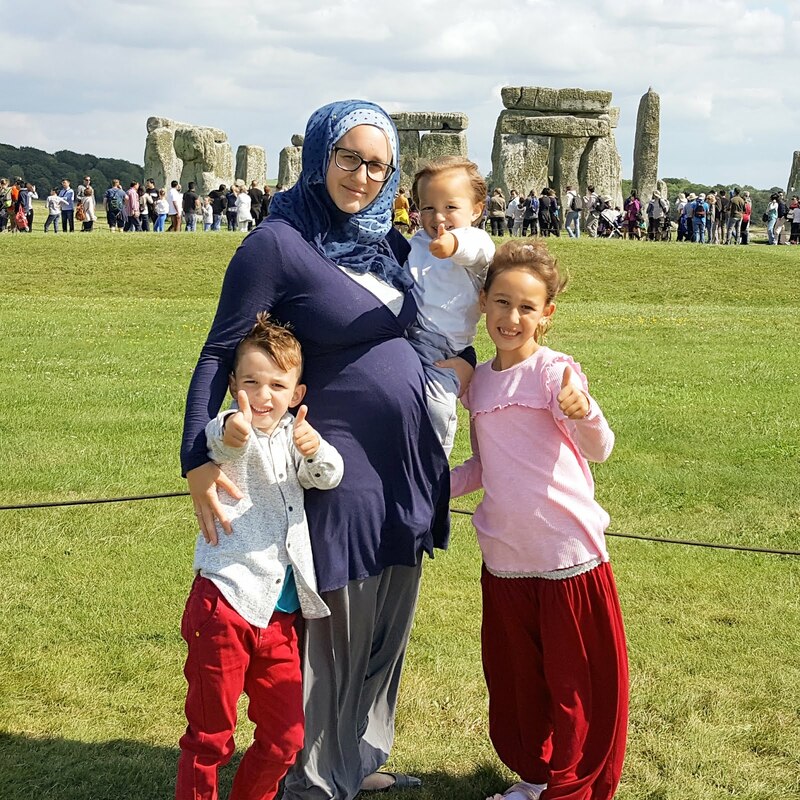 I am sure your kids are proud to have you as their mum and teacher. May Allah make them the coolness of your eyes. Amin. Thank you so much Aisha! That's great! Which languages do you speak at home? It's great that you are teaching your children French. Hope they enjoy the activity!